Giulio Baratta is currently the Head of Investment Grade Finance, EMEA. He coordinates a team of originators dedicated to event-driven financing as well as debt capital markets. Previously, he was Head of EMEA Corporates and CEEMEA DCM. 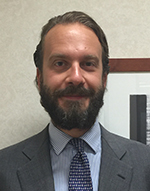 Giulio joined BNP Paribas in 2005. Earlier, he worked at Citi, covering FIG and the Public Sector. Prior to that, he was a credit sales at JP Morgan.